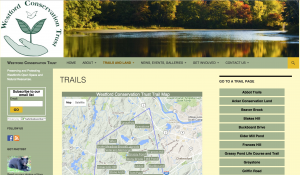 Westford Conservation Trust’s website was built with a popular HTML and CSS development tool which enabled a navigation menu, sidebar and pages for many topics of interest to the trust, its members and the public. Very few people had the skill to manage the site’s content which resulted in sometimes long delays to get new content posted or old content updated, depending on the primary webmaster’s schedule and workload. Westford Conservation Trust (WCT) had good topographic maps on their site along with basic trail maps and, for most properties, one or more photos. A member had walked every trail under WCT management, recording GPS tracks and marking trailheads as he went. This great set of data was not in use on the website. Trail Websites was contracted to update the site, moving it to a modern Content Management System to make on-going content maintenance easier, provide support for small screened mobile devices and to incorporate the GPS data into new locator maps and detailed parking, trailhead and trail maps that overlay the GPS tracks and markers on Google Maps. 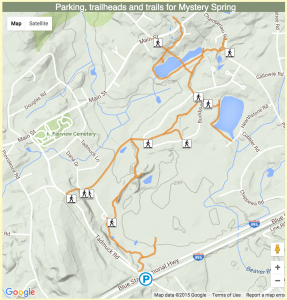 Property and Trail content was moved into Trail Data Manager™ where the GPS coordinates and tracks were added. Trail Data Manager creates the locator map and parking, trailheads and trails from this data on the WCT website. Westford Conservation Trust Directors and Volunteers reacted very positively to the new site during development and at launch. The site is now serving them and their constituents.